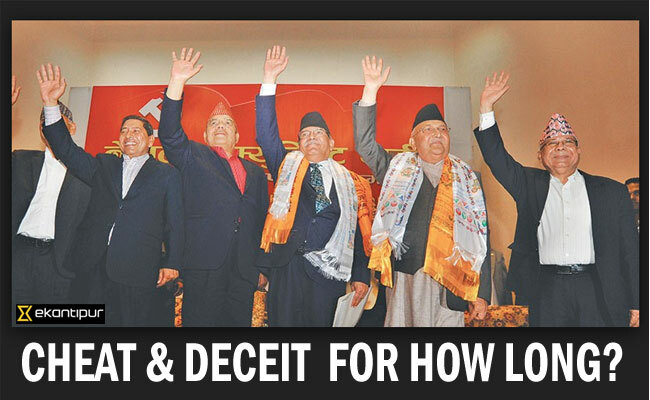 Cheat & Deceit of Nepal’s Communists! NP Upadhyaya, Kathmandu: Chandra Prakash Gajurel- a Maoist leader says that the final objective of people’s war was not to eventually dissolve the revolutionary Maoists’ Party into the United Marxist Leninist (UML) Party. Gajurel presently serves the ‘revolutionary’ faction of the erstwhile Nepal Communist Party – Maoist. The original party headed by Pushpa Kamal Dahal ‘Prachanda’ was dissolved in the UML Party a few months back. Perhaps, Gajurel when refers to the people’s war is pointing towards the same ‘violent war’ which he and his party comrades Baburam Bhattarai and Prachanda had brought into action against their own country by residing not only in New Delhi but also enjoying the alien government’s hospitality. These two Nepali tricksters even mesmerized New Delhi regime or were picked by the traditional neighbor for serving it’s interests? The Maoists party had retained its revolutionary image in the initial days of joining the political mainstream but when the party was transformed into what was called as the ‘Maoists Center’, the likelihood that the Maoists’ movement one fine morning will be dissolved in the capitalistic ideology of the mainstream UML Party, had increased in the political horizon, so claims Gajurel. In essence, says Gajurel, when the Maoists party transformed itself into the Maoists’ center, the new party had already acquired some colors of the UML party. The communist leader made these observations talking to a News channel recently. Gajurel’s ire with Prachanda is not at all a new phenomenon though. To recall, both Mohan Baidya ‘Kiran’ and Gajurel were arrested by the Indian government minutes before the New Delhi forced 12-Points Agreement came into being. Whereas Kiran was arrested in Siliguri, Gajurel was arrested at the Chennai Airport in Chennai. India, Prachanda and Baburam wanted no trouble while signing the “structured agreement”. As was expected, both Kiran and Gajurel have made their distaste against the agreement after they were both released by India from their arrest. The leaders believe that it was Prachanda who had conspired for their arrest. The US Ambassador then in Kathmandu James F Moriarty too was against this 12 point agreement. He had his own explanations. He preferred the King to compromise with the agitating parties. Later the King have had to pay for his arrogance. With the signing of the agreement, the RAW indoctrinated Maoists’ Party leaders landed in Kathmandu with their one point agenda to attack the social fabric of the country. The result is there for all to see. With the Monarchy gone and the Nepali Congress weakened the last attack is inevitably the Nepal Army. To the entire benefit of India and its machinery, the signatories of the 12-Point Agreement continue to plunder the country. The loot continues. Analysts opine that India also wanted Monarchy out from Nepali Politics, as the then King Gyanendra trying to minimize India’s role in the region, had lobbied for China’s entrance into SAARC, which was not at all loved by the Indian ruling elites. The King now lives in the jungles as desired by the Indian regime. China too ignored the King while he was being told to quit the throne. Is China a reliable friend? While talking to one online portal some months back, fiery leader Gajurel is on record to have admitted that his involvement in the Maoists led people’s war in some ways or the other was a Himalayan blunder, in his own words, “we ourselves became effective tool for the damage of our own motherland by residing in an alien land”. His delayed repentance has no meaning. Gajurel, in yet another televised interview had recently said that the federal order in Nepal has become a miserable failure. He also says that Indian penetration in Nepal is very high. Observers value his personal experience. Most of the youths who assisted Prachanda’s war on Nepal now conclude that their engagement was not only bogus but also a ploy of the two Maoists’ tricksters-Baburam and Prachanda. Whereas the Maoists’ Militia have been totally abandoned, the dream sellers occupy lucrative posts in Nepal’s power set up. And this is what the designers of the 12 point agreement had wished. The fact is that Delhi’s trusted men in ‘Nepali disguise’ now control the Nepali State and the State in turn is being controlled by the Indian machinery through them. Rumors also have it that the remaining Maoists’ splinters have also been seduced by New Delhi who shall work as per their masters seated in New Delhi much the same way Baburam Bhattarai and Comrade Prachanda had served in the past. Now that the just arrived new Chinese envoy Ms. Hou Yanqi while meeting with the Defense Minister Ishwar Pokhrel mistakenly(?) told him that Nepal is the connecting point for China with the vast South Asian landmass and that “during my tenure in Nepal, I shall make all the possible efforts to arrange high level visits from my country to Nepal”. In fact she must not have revealed her plans in a determined manner that she will work hard to arrange high level visits from China to Nepal because India doesn’t want that any high ranking Chinese dignitary land in Nepal fearing that during such a visit China may announce gifting of some mega projects to Nepal. The envoy must understand that every second Nepali leader has some mysterious connections with the traditional neighbor in the South, it is widely believed. Most of the present day leaders in Nepal are the signatories to the India drafted 12 point agreement. Let’s hope thus that India may have already instructed its tested and trusted men in Nepal to “work hard” in aborting expected high level visits from China to Nepal. High placed sources claim that India in the past damaged prospects of high level visits from China by destabilizing Nepal such as the change in the leadership of the government or creating a political chaos in Kathmandu so that the Beijing authorities are forced to conclude that the time was not opportune to make a trip to Nepal. “Fluidity in Nepali politics suits to the interests of the Indian regime”, opine those who have understood India better. If so then let’s hope that the incumbent Prime Minister Oli’s days in government are numbered. How Oli will be shaken politically shall be the prerogative of the Indian regime to which our PM apparently possesses respect with heads down. PM Oli has already annoyed India in Davos, Switzerland, wherein he said that he would work hard to give a new lease of life to the India assassinated SAARC. This is just Oli’s lip service to send message across the world that he maintains a desired distance with India. Pakistan knows what PM Oli is. Baby Bhutan and Bangladesh and more recently the Maldives must have smiled listening to PM Oli’s talk in Davos on the SAARC revival. If, in such a situation, Prachanda, threatens split of the freshly formed Nepal Communist Party, who co-chairs the party with Prime Minister Oli, then that would be no wonder as the latter has been ‘exported by design’ to Nepal in order to act as per the dictates of the Indian regime. Observers opine that Prachanda must pay the Indian debt and thus his chances of being used as an effective tool to destabilize PM Oli’s seat remains high which is just to abort the possibility of China’s high level visits to Nepal. There are rumors that Madhav Kumar Nepal- a disciple of father Sun Myung Moon in a Communist disguise, too has become active and has hinted that he is not at all pleased with his own party Chairman and Prime Minister K.P. Oli. Nepal too is believed that he is equally taken as a my-dear friend of the Indian regime. Nepal said recently “There will be no development in Nepal as long as KP Sharma Oli is the Prime Minister”. This perhaps explains his assessment of Prime Minister in the present context which provides the slight hint that he too may have already been approached by New Delhi for accomplishing some exclusive political jobs. To recall, Nepal is the same Communist leader who in 1990 had proposed to invite Indian Army to oust the Nepali monarchy. Nepal ruled the United Marxist Leninist Party for not less than a decade and a half at a single stretch. It was in this period Nepal cultivated his intimate ties with the Indian establishment which used this friendship to the hilt. While we talk of the communist leader, we are reminded of his claim that “I have some role in bringing President Donald Trump and the North Korean leader to the negotiating table in Singapore last year in June. Whether Mr. Nepal could have played this role as claimed by him or not, is a different matter however, what is for sure is that he is a regular visitor to Korea, both north and South. Why he made regular trips to South Korea is now understandable with his visible connections with the Universal Peace Foundation whose main office is located in South Korea. President Trump is meeting the North Korean leader Kim Jong-Un by the end of February, next month in Hanoi, Vietnam. Nepal may even claim that he facilitated this Trump and Kim meet in Hanoi. Apart from Mr. Nepal, and Prachanda, now we have one more leader who has joined the ‘sack Oli mission’ apparently. He is Bhim Rawal-a very powerful leader in the former UML. Rawal went against PM Oli since the Prime Minister associated himself with the declared anti-Communist platform-the Universal peace foundation. PM Oli has to go as he is the Prime Minister of a poor country but takes pleasure in wearing shoes made by Louis Vuitton which costs somewhere close to one lack rupees in Nepali currency. He was spotted with this French shoes while being interviewed by the German TV in Davos, Switzerland. He yet claimed that he was the servant of the people in Davos but concurrently warned the Nepal’s media sector. It must be noted that the State has already invested some 18 Crore Rupees for keeping Oli’s Kidney’s health in vigorous conditions. He is one of the most fortunate leaders in Nepal after the change of 2006 to have drained the national exchequer with such a proper finesse. After all, how long will the world’s poorest nation have to bear with these luxurious Communist thugs? And he appeals from DAVOS to invest in Nepal so that he and his ilk could milk the State easily. What a terrible joke? Thanks 12 point agreement.